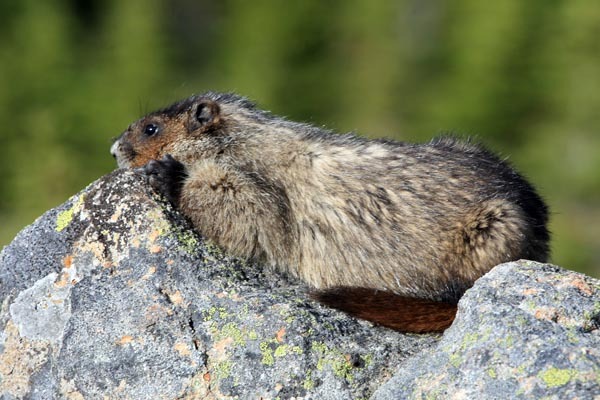 Marmots can be seen sunning themselves on rocks at higher elevations throughout Yoho National Park. Wildlife viewing in Yoho National Park is not as productive as in the other parks of the Canadian Rockies, simply because the terrain is so rugged. The Kicking Horse River Valley, through with the main highway runs, is inhabited by mule deer, elk, moose, black bears, and a wide variety of smaller mammals. Porcupines are common along Yoho Valley Road. The park has a healthy population of grizzly bears, but sightings are relatively rare because the grizzly tends to remain in remote valleys far from the busy TransCanada Highway corridor. Much of the park is above the tree line; here noisy marmots and pikas find a home, along with an estimated 400 mountain goats. The best chances of viewing these mammals is in the Lake O’Hara region and along the Iceline Trail. The animals for which Yoho is best known are fossilized in beds of shale and have been dead for more than 500 million years. But they still create great interest for the role their remains have played in our understanding of life on earth in prehistoric times. For details visit the Burgess Shale page. Even if you’re not interested in photography, the Canadian Rockies Wildlife Photography eBook, by renowned wildlife photographer Wayne Lynch, is a great resource for searching out local wildlife. It includes all the very best places to view wildlife in Yoho National Park. An abundance of wildlife is one of the biggest draws of the Canadian Rockies. To help preserve this precious resource, obey fishing and hunting regulations and use common sense. Do not feed the animals. Many animals may seem tame, but feeding them endangers yourself, the animal, and other visitors, as animals become aggressive when looking for handouts (even the smallest critters, such as squirrels). Store food safely. When camping, keep food in your vehicle or out of reach of animals. Just leaving it in a cooler isn’t good enough. Keep your distance. Although it’s tempting to get close to wildlife for a better look or a photograph, it disturbs the animal and, in many cases, can be dangerous. Drive carefully. The most common cause of premature death for larger mammals is being hit by vehicles.